Inspired by the delicacy, layers and color of Mexican paper flowers, the Bloom sandal will send your girl feet first into spring. This finely-crafted shoe in fuchsia leather boasts a hand-cut sunburst orange leather flower with patent yellow center and patent yellow dots in the detailing. The small opening in front will keep toes protected but allow breathability. • comfortable, breathable inner sole. • flexible rubber outer sole. • padded collars for comfort. 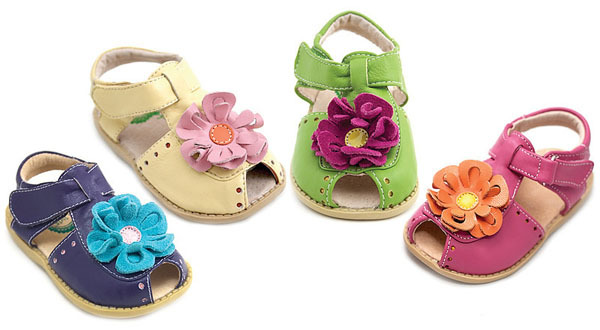 • each pair of shoes weighs less than ½ pound. Let Us Know that you are interested.